Explore the transformational power of Buddhism when you download two classic films: Meditate and Destroy and The Tibetan Book of the Dead. 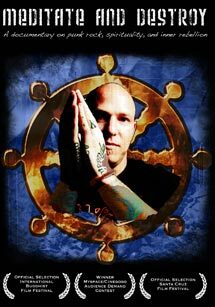 Meditate and Destroy is a powerful and moving documentary chronicling Noah Levine's harrowing journey from addict and juvenile delinquent to leader of America's first Buddhist punk movement: Dharma Punx. Directed by Sarah Fisher, Meditate and Destroy is the first film to trace the influence of this movement in major cities throughout America, where a new generation of youths are increasingly turning to meditation as a departure from drugs, violence and crime. The Tibetan Book of the Dead is a two-part series exploring the titular spiritual text originating in the spiritual cultures of the Himalayas. Leonard Cohen's narration and the film's breathtaking cinematography combine to boldly visualize the afterlife according to the ancient text's wisdom. The resulting effort has been described by CM Magazine as a "marvelous documentary creation" that "demands multiple viewings." Both films are sure to enlighten you. Lorber Films has picked up "Genius Within: The Inner Life of Glenn Gould," set for a theatrical release opening in September at Gotham's Lincoln Plaza Cinemas. DVD and digital will follow in early 2011. Deal was negotiated by Lorber's Richard Lorber and Elizabeth Sheldon with Film Transit Intl. 's Diana Holtzberg and White Pine Pictures' Kelly Jenkins. The human rights movement makes its way to Video On Demand (VOD) with Kimjongilia, offering all Americans the opportunity to take part through viewing this momentous documentary through instant online viewing or downloading. Testament to the power of the information age to bring to light the atrocities of the world's most isolated nation, this VOD release will reveal the tragedies of the ongoing totalitarian state of Kim Jong Il, the last large-scale totalitarian state of the twentieth century. Not yet available on DVD, Kimjongilia is accessible now from the comfort of home or on iPod, iPhone, or iPad at MyFilmBlog.com. Winner of the Best Film 2010 from One World Brussels, in co-op with Human Rights Democracy Network, Kimjongilia is a cri de coeur that will put North Korea on the table in human rights debates around the world. To read Filmmaker N.C. Heikin's blog visit Kimjongilia.MyFilmBlog.com. Access bonus interviews not included in the final cut, ask the filmmaker questions, and learn what you can do to stop the death camps in North Korea. Kimjongilia had its U.S. premiere at New York's Cinema Village and will also be available at select theaters and community screenings across America before the DVD release. Click here to find out about upcoming screenings and learn how you can host a screening in your community. Critically acclaimed documentary about the dramatic performance of one of the reigning queens of contemporary theater and film, Meryl Streep, as she interprets the role of Mother Courage in Tony Kushner's The Public Theater/NY Shakespeare Festival in Central Park production of Mother Courage and Her Children. This inspired doc investigates the power of theater to provoke its viewers out of their complacency in the midst of protracted war, and proves the urgent relevancy of the great 1939 anti-war play by one of the twentieth century's most renowned playwrights, Bertolt Brecht. Definitive film on the gypsy punk rock band and international sensation uncovers the insane party culture of the band and its leader and borderline movie star Eugene Hutz. GOGOL BORDELLO NON-STOP is an artful documentary that mixes flamboyant costumes, intricate dance choreography, a relentless beat and an explosive energy not seen since the dawn of rock ‘n’ roll. New York, NY - March 12, 2009 - Lorber HT Digital has acquired the U.S. theatrical rights and public performance rights to the acclaimed documentary NOLLYWOOD BABYLON, co-directed by Ben Addelman and Samir Mallal, on the heels of the film's U.S. premiere at the 2009 Sundance Film Festival as part of the World Cinema Documentary Competition. The deal was negotiated by Christina Rogers for the National Film Board and by Richard Lorber and Elizabeth Sheldon for Lorber HT Digital. Lorber HT Digital will open NOLLYWOOD BABYLON theatrically at select venues in the second quarter of this year, and will also make it available to educational and cultural institutions. After the initial theatrical release, Lorber HT Digital will release the DVD to the consumer market on its Alive Mind label later in 2009. Industry pioneer Richard Lorber, founder of Lorber HT Digital, comments on the acquisition, "NOLLYWOOD BABYLON celebrates the power of film to transform a culture and an industry. The explosion of Nigerian cinema over the last two decades is the reclaiming of African story-telling and culture by and for Africans. Nigeria is the new cultural center of Africa and Nollywood is the epicenter." Kenneth Turan of the Los Angeles Times calls the film, "...an irresistible treatise on the Nigerian film industry..."
NOLLYWOOD BABYLON chronicles the wild world of "Nollywood," a term coined in the early ‘90s to describe the world's fastest-growing national cinema, surpassed only by its Indian counterpart. The film delves first-hand into Nigeria's explosive homegrown movie industry, where Jesus and voodoo vie for screen time. Lancelot Oduwa Imasuen, known in Lagos as "Da Governor," is one of the most influential men in Nollywood. Undeterred by miniscule budgets, Da Governor is one of a cadre of resourceful filmmakers creating a garish, imaginative, and wildly popular form of B-movie that has frenzied fans begging for more. Among the bustling stalls of Lagos's Idumato market, films are sold, and budding stars are born. Creating stories that explore the growing battle between traditional mysticism and modern culture, good versus evil, witchcraft and Christianity, Nollywood auteurs have mastered a down-and-dirty, straight-to-video production formula that has become the industry standard in a country plagued by poverty. This burgeoning Nigerian film industry is tapping a national identity where proud Africans are telling their own stories to a public hungry to see their lives on screen. Peppered with outrageously juicy movie clips and buoyed by a rousing score fusing Afropop and traditional sounds, NOLLYWOOD BABYLON celebrates the distinctive power of Nigerian cinema as it marvels in the magic of movies.